Your plants need lime. The quickest way to solve the problem is mix lime in water and use the water to water your plants. Then work some lime into the soil. Judging from the pictures, and what I've got going on in my own garden (i.e. earliest fruiting toms have a little cat facing *cold weather, erratic pollenation*), you've got cat facing and not blossom end rot. I have never heard of cat facing. What causes that? 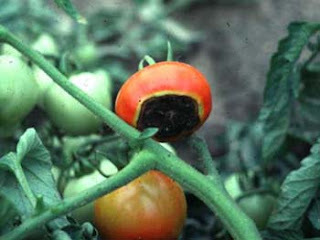 Lime in the soil will not stop bottom end rot I'm afraid. Calcium travels very slowly through any plant. That's why apples growing on chalk soils can still get Bitter Pit ( which is caused by calcium deficiancy). As has been said. BER is a problem of insificiant water when the plant is under heavy transperation times. The basic problem is when the root system is not in balance with the plants top and is not big enough to replace the water loss through the leaves in hot weather. That's why Toms grown in grow-bags suffer so much from the problem. It helps if the plants are not allowed to develope too strongly in the period up to first truss setting. Either by delaying final planting or keeping the Nitrogen part of the feeding down to a low level until the first fruit has set. I was really disappointed to find spots in a my garden tomato plant, Then i was just cut few and open both affected tomatoes and I saw there is no worm inside. Any one had to find out outside worm to potato? I just to got it first time and I want to clean up that worms. TG, tomato hornworms are just not hiders. In fact they are about the worst insect at hiding I can think of; they are big and obvious. The Helpful Gardener wrote: TG, tomato hornworms are just not hiders. In fact they are about the worst insect at hiding I can think of; they are big and obvious. I find it's puzzleing HG that Sevin is still available over there in the States. I assumed that you were far more H&S concious than us here in the UK. We banned the wretched stuff many years ago now as it is so persistant in the soil and a carcinogenic to boot. To add my 2 cents. It is NOT BER and it is NOT Hornworms. It could be catfacing but as HG suggested it could very well be some other fungal disease. As your Winston Churchill said "The Americans can always be counted on to do the right thing...after they have exhausted all other possibilities..."
And somehow grew to be the leader of the free world, rescued all of europe and asia from tyranny, and developed techniques that fed the world. But then again, I enjoy rooting for the home team.